Standard Chartered and Siemens Financial Services, the financing arm of Siemens, are kicking off what they call “an industry-first client pilot” for blockchain-based smart guarantees in trade finance. They will do so in collaboration with blockchain firm TradeIX, a provider of a trade finance specific open-source blockchain platform, which allows financial institutions to develop their own trade finance applications with open APIs. Using TradeIX’s tools, Standard Chartered and Siemens started building the solution in March. It is among a number of proof of concepts that the bank has conducted on the open platform – and one which it has now decided to pilot with the purpose of commercialisation. Built on R3’s Corda framework, the solution will enable Siemens to digitise and automate its guarantee process – a traditionally paper-intensive business – for customers with large transaction volumes, from initiation of the bank guarantee to the claim handling. It utilises a decentralised ledger and auto-executing smart contracts to provides a streamlined communication tool between the guarantee issuer (in this case Siemens), the bank (Standard Chartered), and the beneficiary (Siemens’ customers). The pilot is expected to be fully completed later this year. “Unlike a letter of credit, which involves multiple parties, performance details and over 100 pages of documents, a commercial bank guarantee is a much simpler instrument to digitise,” Standard Chartered says in a statement. 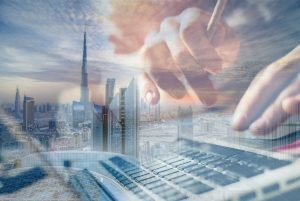 According to Michael Bueker, CFO at Siemens in the Middle East, having such a digital trade finance solution “is an important step” toward making the company’s trade finance operations “smoother, faster and more efficient”. “We are delighted to partner with Standard Chartered in leading such a game-changing transformation, which will help our customers go digital in their guarantee and claim processes and achieve higher efficiency,” he adds. The parties will pilot the solution in the UAE, which offers a good location for such an initiative, given the government’s “enormous drive for digitalisation and blockchain”, Daniel Cotti, CFO at TradeIX, tells GTR. He adds that most of the beneficiaries of the guarantees will be government entities. The UAE has thrown its weight behind blockchain more so than any other government in the region. In April, it launched its Emirates Blockchain Strategy, which seeks to transform 50% of government transactions into the blockchain platform by 2021. In doing so it expects to save AED11bn in transactions and documents processed routinely, 398 million printed documents annually and 77 million work hours annually. Meanwhile, Dubai has its own blockchain strategy, run by its Smart City Office. Commenting on the pilot, Motasim Iqbal, Standard Chartered’s head of transaction banking in the UAE, says: “This is an industry-defining solution which we believe will transform the way guarantees are issued and processed in the UAE. Siemens Financial Services has been a key partner for us to build and develop this pilot on the distributed ledger and we believe that this technology can further be harnessed by the Dubai Smart City initiative.” A range of projects are currently being carried out on TradeIX’s platform. The most prominent one goes under the name Marco Polo and is a platform for open account trade developed with R3 and 10 international banks, also including Standard Chartered. Pilots for this project are currently being prepared and are scheduled to begin in October, before being commercialised next year. The blockchain firm has also worked with Standard Chartered and global insurer AIG on a project to develop a blockchain-powered invoice finance programme for DHL. Now implemented by the logistics company, the solution helps its customers extend their payment period whilst maintaining the company’s receivables at current terms. The post Standard Chartered and Siemens pilot blockchain-based trade finance guarantees in UAE appeared first on Global Trade Review (GTR).